Who's unpopular in the Michigan area right now? 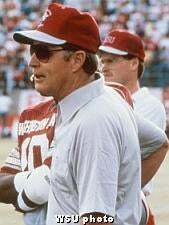 Former Washington State coach Jim Walden, the one member of the Harris BCS poll who voted Florida No. 1 in the country and one of the reasons the Gators are playing Ohio State in the BCS "title" game rather than Michigan. Walden is hardly alone in his questionable decision-making — Louisville seems unusually high in a few ballots — but he's the only one who put Florida No. 1. It's odd, too, because earlier this year he vowed he wouldn't make a decision like that. "You're never going to get me to vote for one team ahead of a team that's only lost to the best team in the country," Walden said. Yeah, that's a quote that's gonna hurt. Almost as much as fellow voter Brentson Buckner, who said he voted Florida ahead of Michigan because the Gators' only loss was to LSU, which, of course, it wasn't. This all seems a lot of bluster to us; even if Michigan fans are right — and personally, we think they are — they're yelling at the wrong people. Yes, Walden and Buckner might be completely unqualified to be part of the decision-making process on this, but that there's a decision-making process on this at all is ridiculous. Until they fix this, this is going to happen every year, and we're going to have this same damned debate. And it's not going to change. This is why college football isn't as much fun as college basketball, and until they realize that, it never will be.